Choosing the right graduate program takes time and can require some work. Here are some tips to help you navigate the application process along with some answers to frequently asked questions. Note that the deadline is January 15. (Late applications may be considered but funding could be limited.) 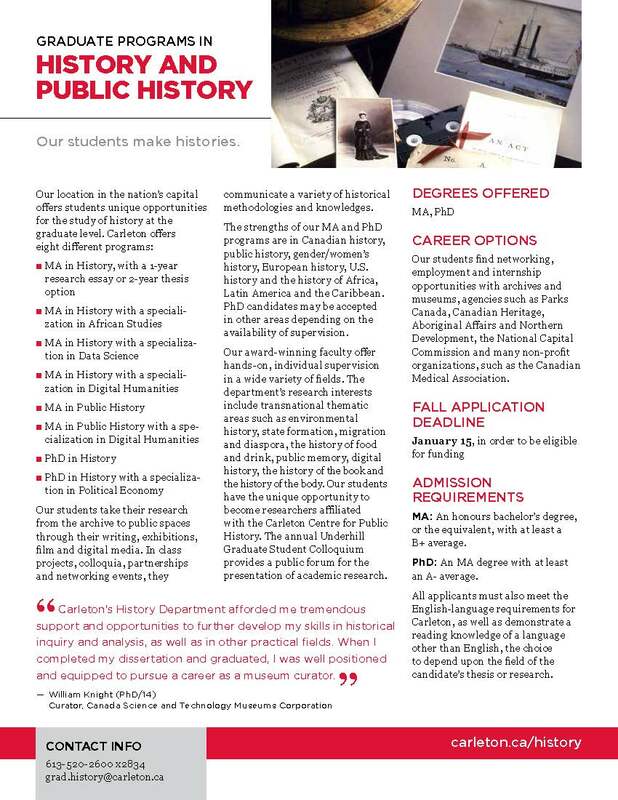 If you have a specific question about the different graduate streams offered by the Department of History, please contact the Graduate administrator. How do I go about applying to a graduate program in History? Apply on-line at https://graduate.carleton.ca/apply-online/ to create an account and follow the steps and instructions outlined. Carleton will email you instructions on how to access Carleton Central (where your application information is stored). Your Carleton User ID is used to access Carleton Central, and will be assigned to you via email. Note that it may take 1-3 business days after processing the application fee to receive this email. We advise students not to wait until the last minute to apply online. Once you are registered with Carleton Central, you will still have time to upload and update your documents. Registering early, however, will give your referees more time to complete their assessments, and this will reduce any delays in processing your application. Should I contact a potential supervisor or will a supervisor be assigned to me? You may wish to contact potential supervisors in advance. For applicants to the PhD program, this is highly recommended. We only admit students where adequate supervision exists, so it is a good idea to look at our faculty pages to make sure you are not applying to undertake a project that we cannot supervise. A potential supervisor will be assigned to you if you are given an offer of admission, but this is subject to change, depending on how your research project evolves. What documents will I need to apply to a graduate program in History? Can I submit more than 2 letters of reference? Who should write my references? Two letters of reference is the minimum required. The system will allow you to submit up to three, but usually a third letter is not required unless there are special circumstances surrounding your application. Academic references, especially those that can speak to your senior undergraduate or most recent graduate experience, are generally preferable to references from employers. If you have experience working in a history-related field or if you believe that an employer can best speak to your current abilities, then this is a good situation to use the option of a third letter. Once you are registered in the online system, Carleton Central will send an electronic invitation to your referees so that they can fill out a letter of reference. In order to give your referees time to do this, it is a good idea to make sure you register well in advance of the due date (January 15) in order to avoid delays in processing your application. What should be in my statement of intent? A Statement of Intent is generally focused on the research project you intend to pursue, either as a thesis, a dissertation, or as a research essay. As far as possible at this stage, explain your research interests; what questions are you asking, what is your geographical region, what is the time period you are studying? What sources (or types of sources) do you intend to use, and how are you planning to approach the topic? Although not required, applicants are also encouraged to comment on why Carleton would be a good place to pursue your research. Of course, we expect that all research projects will change over time, but being able to articulate your interests in this way is an important first step. What you put down in your statement will give the graduate committee a good sense of who might supervise your topic and how the department can support it through resources and course work. It is often a good idea to make some of these connections yourself, linking your work to particular areas of strength offered by the department. If you have an idea of who might supervise your research, feel free to mention it. If you have been in touch with particular members of the department about your project, please include this information in your statement. You may wish to take some time to explain how you came to the topic, explain certain things about your academic record, or introduce your writing sample. It is often helpful to prepare the Statement of Intent well in advance and to provide potential referees with a copy. This will improve their ability to speak to your research interests, and you might gain valuable feedback from them on your research. Your Statement of Intent should be between 1 to 2 single-spaced pages in length, although we expect that doctoral applicants should use the full two pages to outline their research projects. What can I use as Writing Sample? Ideally, the writing sample should be a recent piece of writing that demonstrates your ability to work with both primary and secondary sources, showcases your ability to analyse and interpret texts, and offers a sense of your writing style. It can be a paper from a course, a publication, or a chapter from a thesis or longer research essay. The writing sample does not need to necessarily match your intended project, although in some cases you may want to emphasize your background and abilities in a particular research area. The writing sample should be 20-40 pages for Ph.D. applicants, 10-20 pages for M.A., applicants. Please provide a short introduction explaining the context of the writing sample, and whether it is an extract or a full text. Where do I upload all of this stuff? Once you have an account in Carleton Central ( https://graduate.carleton.ca/apply-online/ ), follow the online instructions carefully to upload the required documents in .pdf format. You do not need to upload all of the documents at once, but documents missing after the deadline can delay the processing of your application. What kind of financial support can I expect if I apply to History? Great! Send them to us and we’ll respond as soon as we can.